Star colt The Autumn Sun has run his last race – for this season. Trainer Chris Waller has announced the five-time Group 1 winning three-year-old is to be spelled, and is out of The Championships, but is hopeful of convincing his owners to race him on at four. The announcement comes on the same day it was revealed the colt’s sire Redoute’s Choice had died at Arrowfield Stud sparking conjecture as to whether The Autumn Sun would serve as his replacement for the coming breeding season. The Autumn Sun wins the Rosehill Guineas. Pic: Steve Hart. “I have firsthand experience of the benefit time can provide a horse when looked after during their juvenile years and I feel I am best qualified to make the judgement on the future improvement he will make as a developed and mature horse. 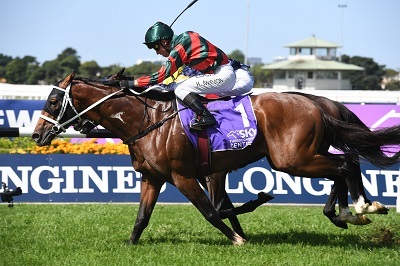 The Autumn Sun took his record to eight wins from nine starts, and just under $3.5 million in prizemoney, with a hard fought victory in last Saturday’s Group 1 Rosehill Guineas (2000m). The decision ends the speculation over a potential clash with champion stablemate Winx in the Queen Elizabeth Stakes next month. Waller said pulling up stumps now is in the best interests of the horse who only made his debut on Anzac Day last year. He describes the colt as having “exceptional ability’’ while still being an immature horse. “This decision was formed on the basis that he is still is a young horse who is continuing to grow and develop,’’ he said. There are a host of options for The Autumn Sun as a four-year-old including the inaugural running of the $7.5m The Golden Eagle (1500m) on his home track Rosehill in November where he’s TAB’s $3.50 favourite eight months out from the race. The wait is now on until an announcement confirming whether he’ll race on at four, and have the chance to prove himself a champion against all comers, or be retired.